The Ram ProMaster photo shoot was both interesting and fun. Our new ProMaster had only just arrived at Ranger Design and without further ado we were upfitting it with the industries best shelving. It looked great! A tough work truck with the toughest equipment. Need Ram ProMaster pictures for your website? Looking for images for a poster? Download them here. 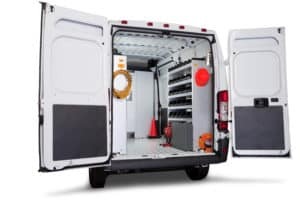 We shot our Contractor package, Service package, Electrical package and Delivery Package. Our new C30-X swing door partition also featured in all the pictures. 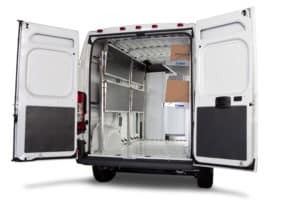 The Ram ProMaster has been a fun project for Ranger Design right from the start. 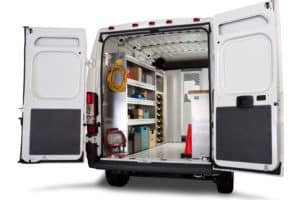 We launched our Ram ProMaster package catalog in July. We opened the order book and were ready to ship in August. Now we have just completed a photo shoot bringing our products to life in Rams hardworking, new truck. So what’s next in the Ram/Ranger Design story? Look for our Ram ProMaster at the NTEA Show in March 2014. In the meantime our ProMaster is on the road going State to State with our sales team. Contact our customer service desk to find out when it will be in your area – cs@rangerdesigninc.com or call 800-565-5321.